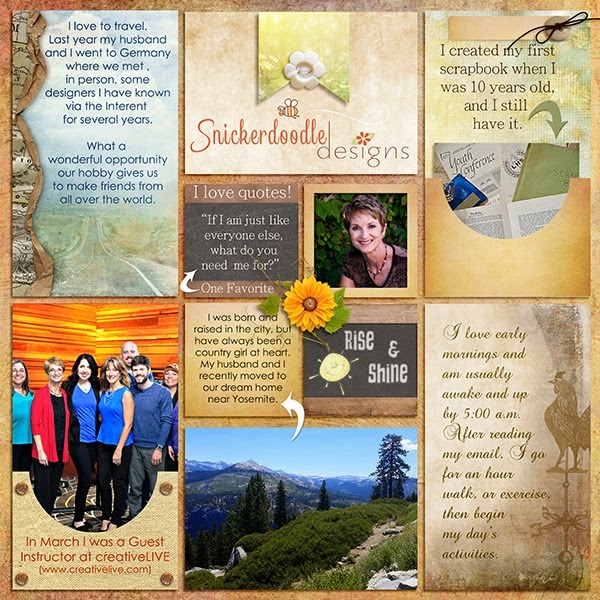 MyMemories Blog: Today's Daily Designer....Snickerdoodle Designs! My name is Karen and I live in California, USA. I have always lived in big cities in Southern California, but my husband and I moved, just last month, to Coarsegold, a very small town near Yosemite. Small towns offer a totally different lifestyle than we are used to… which is exactly why we moved! Just yesterday I woke up to find a deer standing about 8 feet from my back door. For a City Girl, that was pretty amazing! I have always been interested in keeping scrapbooks, and created my first one when I was just 10 years old! I still have it and it’s so much fun to browse through, to see what was important to me back then. In mid-2008, I was designing an online photo album, using the company's templates. I wondered if there wasn't a way to "fancy up" the templates a bit, and started doing online research. I "knew" about digital scrapping, but had been resistant to it up to this point; however, when I saw how I could incorporate digital design with my love of computers, and still be creative, I was a quick convert. I became good friends with a designer, and by the end of 2008 was designing word art for her to use in her kits. I also started designing custom fonts. 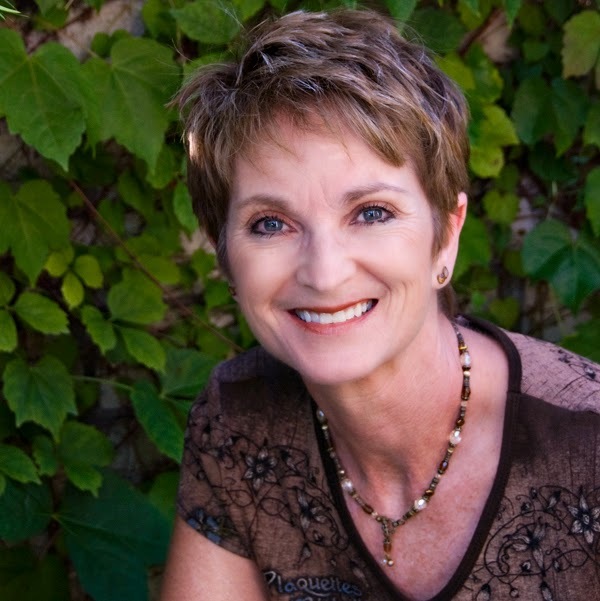 While I loved what I was doing, I found myself compelled to create my own designs and began designing kits and commercial-use products in January 2010. When I started designing, I gave a lot of thought to my design name. I wanted my work to inspire in others feelings of warmth, coziness, and a bit of fun. So I tried to think of what inspired those things in me. The first thing that came to my mind was my Mom's Snickerdoodle. My Mom was always baking something and I loved her Snickerdoodle cookies the most! So I became SnickerdoodleDesigns. My Mom died when I was just 23 years old, so my design name is a tribute to her. As designers we are all inspired by different things. I love music, quotes, and nature and am most often inspired by these things. However, I was once inspired by a cancelled vacation! In April of 2010, after a year’s planning and excitement, my husband and I were at the Los Angeles, CA airport – bags all packed, tickets in hand, ready to go through the Check-In process for a trip to Germany. As we handed our tickets to the Agent, he looked at us, then our tickets, then us again and said, “You need to come with me.” Those aren’t necessarily words you want to hear from a Ticket Agent…. But we followed him. We were told that because of the eruption of the Eyjafjallajokull volcano in Iceland, many airports in Europe were being closed – including the airport we were flying into. They didn’t know how many days it would be closed, or when we might be able to travel there. Disheartened, we picked up our bags and left the airport. On our drive home, my husband and I wondered what we would do for the next 2 weeks when we suddenly thought…. If we can’t get to Europe, Europeans can’t get out of their country either….. and that means cruise lines might have a LOT of cancellations! Once home, we jumped online, found a cruise to the Caribbean that interested us, (and, yes, they did have a lot of cancellations), and we were able to book right away. We exchanged the sweaters and jeans we had packed for Germany with sunblock and swimsuits, and were on a ship in the Caribbean 3 days later. When we returned home from our vacation, I designed a kit entitled “Smooth Sailing,” to commemorate our experience. Sign up for my SnickerNews Newsletter and receive a free Snickerdoodle Cooke Alpha!